Though not at all obvious from this video, these particles are actually bumping into each other and sending waves of high particle density up the column even though the mean particle velocity is zero. This behavior had not previously been investigated in three-dimensional columns of fluid. We found many interesting details about the way these particles move around, including that a theory developed for one-dimensional motion still does a good job of predicting the speed of the high density waves in a three-dimensional setting. Our 3D results (symbols) support existing 1D theory (lines) predicting the relationship between particle volume fraction (φ) and continuity wave speed (c). The results of a fully resolved simulation of up to 2000 spheres suspended in a vertical liquid stream are analyzed by a method based on a truncated Fourier series expansion. It is shown that, in this way, it is possible to identify continuity (or kinematic) waves and to determine their velocity, which is found to closely agree with the theory of one-dimensional continuity waves based on the Richardson-Zaki drag correlation. Today is the big release day for Crædl, the Collaborative Research Administration Environment and Data Library. It is a tool designed to work alongside researchers in their labs to simplify data management. It assists researchers in sharing work with collaborators and discovering work made available within the larger research community. The first Crædl (hemi.craedl.org) belongs to the Hopkins Extreme Materials Institute (HEMI), which funded its development. It was inspired by the difficulties HEMI researchers were having with collaboration and data sharing, especially the sharing of large (think terabytes) files. Crædl provides a framework for managing data that automates the process of attaching metadata (the information describing the data), which is essential for enabling data search and discovery. Finally, Crædl helps research groups manage their projects and their researchers (HEMI is a rather large institute) to improve research outcomes. If you’re interested in learning more about Crædl and its features, head over to craedl.org. If you’re interested in trying out Crædl in your own research group, send an email to info@craedl.org describing your group. We’re not currently open to new research groups, but we are working towards expanding our reach in the future. I’ve personally lead the Crædl project from its inception about a year ago, and I’m excited to release it into the wild. I know it currently provides some valuable tools to researchers, but it’s still early days. I have many big ideas for features yet to come, so keep an eye out for more updates. I’m excited to announce the publication of work with my colleagues in a new paper, Fully resolved simulation of particulate flows with particles-fluid heat transfer, in the Journal of Computational Physics. This paper describes an extension of my previous work, adding the ability to account for heat transfer between particles and the surrounding fluid. Time-dependence of the temperature of a particle immersed in a warmer uniform flow with Re = 50. The solid lines are the present results and the dashed lines the results of Balachandar, S., Ha, M. Y., 2001. This is an especially important new capability because particle flows are so frequently used in industrial chemical processing applications where temperature must be closely controlled. Whether heat is being added to catalyze a chemical reaction or is a result of the chemical reaction itself, our new method is able to simulate this phenomenon accurately and efficiently. Implemented to run on GPUs, our method can simulate thousands of particles, providing a new window though which we can work to improve our understanding of the behavior of particle flows. By learning more about particle flows, we can make existing chemical processing technologies faster, safer, and less expensive. The Physalis method for the fully resolved simulation of particulate flows is extended to include heat transfer between the particles and the fluid. The particles are treated in the lumped capacitance approximation. 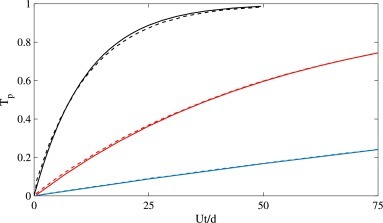 The simulation of several steady and time-dependent situations for which exact solutions or exact balance relations are available illustrates the accuracy and reliability of the method. Some examples including natural convection in the Boussinesq approximation are also described. Computers, one of the most important tools in science and engineering, find applications in all aspects of academia and industry alike. Though expected to employ this tool effectively, few scientist and engineers have been trained to harness the power at their fingertips, and most could benefit significantly from a high-level exposure to scientific computing methodology. This tutorial series will introduce many computational tools, tricks, and tips that would otherwise take years of trial and error to learn. No prior experience is required. Please bring a laptop to participate in the tutorials. The tutorial series is designed to build on itself as it progresses and we strongly discourage skipping tutorials. For a smaller time commitment, consider attending one of our training workshops. We reserve the right to modify this schedule as the tutorial series progresses. Click here to register for this free MARCC Training Series. I am happy to announce that I will be offering a new course for Intersession 2017 at Johns Hopkins University, entitled Introduction to Scientific Computing (EN.530.391.13). The interactive two-credit course designed to teach upper-level undergraduate students and new graduate students about the true capabilities of their computers–beyond email and internet–will take place from 10 through 26 January 2017. As with all Intersession courses, Introduction to Scientific Computing will be offered free of charge to students enrolled at Johns Hopkins University for the fall 2015 semester. Registration for Intersession 2017 opens 6 December 2016 at 07:00. Have a question about the course? Submit a comment below or contact me. The most important tool in science and engineering, computers find applications in all aspects of academia and industry alike. Though expected to employ this tool effectively, few scientists or engineers have been trained to harness the power at their fingertips, and most could benefit significantly from a high-level exposure to scientific computing methodology. This course will introduce many computational tools, tricks, and tips that would otherwise require years of trial and error to learn. This course will be strongly focused on increasing user proficiency with computational resources, such as those provided by the Maryland Advanced Research Computing Center (MARCC) run by Johns Hopkins University. My paper, GPU-centric resolved-particle disperse two-phase flow simulation using the Physalis method, has recently been published in the Journal Computer Physics Communications. The sibling to my previous paper, Resolved-particle simulation by the Physalis method: Enhancements and new capabilities, the current work more thoroughly details the algorithmic advancements I developed to improve the computational throughput of the Physalis method itself. As can be seen in the figure below, the largest simulations run more than 60 times faster when using an Nvidia Titan GPU than an Intel CPU alone. We present work on a new implementation of the Physalis method for resolved-particle disperse two-phase flow simulations. We discuss specifically our GPU-centric programming model that avoids all device-host data communication during the simulation. Summarizing the details underlying the implementation of the Physalis method, we illustrate the application of two GPU-centric parallelization paradigms and record insights on how to best leverage the GPU’s prioritization of bandwidth over latency. We perform a comparison of the computational efficiency between the current GPU-centric implementation and a legacy serial-CPU-optimized code and conclude that the GPU hardware accounts for run time improvements up to a factor of 60 by carefully normalizing the run times of both codes. I am excited to announce that I have accepted an appointment as an Assistant Research Scientist in the Department of Mechanical Engineering at the Johns Hopkins University. In this new role, I will work extensively within the Maryland Advanced Research Computing Center (MARCC; pronounced Marcy) to support the development and implementation of high-performance computing applications used for transformational research within the University and beyond. As a natural extension of my Ph.D. work, I look forward to developing new computational capabilities and to teaching users about this outstanding high-performance computing resource. Some of the hardware that comprises MARCC’s Bluecrab cluster, as viewed during a tour of the facility with my Fall 2015 course. An example of a particle-laden flow simulation performed using Bluebottle on MARCC.